Sure, the Dodgers and Giants are playing a rubber game tonight. 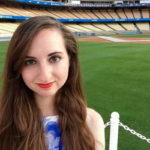 But let’s be real here: the most exciting thing happening at Chavez Ravine this evening isn’t the game, but rather the Vin Scully Ring of Honor ceremony. Vin is the first non-player and non-manager to receive this distinction. 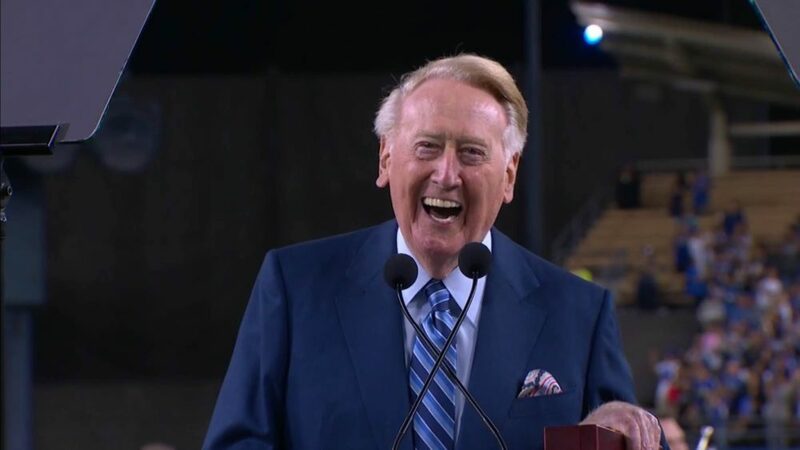 We all miss Vin a ton, of course, and it’ll be wonderful seeing him in front of the crowd at Blue Heaven on Earth once more. He treated the media to a 15-minute press conference earlier today, and the entire thing is available to stream through the Dodgers’ Facebook page. The big takeaways are that retirement is treating him well, and this will likely be his last time in the spotlight at Dodger Stadium (he may come to games, but he’ll do so inconspicuously). With all that said, there is actually a game happening, so we should probably talk about that a bit. Julio Urías (1.59 ERA, 3.71 FIP, 1.412 WHIP) will be making his second start of the season. His first start also came against the Giants, and it was a strong effort: just one run allowed in 5.2 innings pitched, with four hits, four walks and four strikeouts. If you want some pre-game reading, Scott Miller profiled Urías in a piece run earlier today at Bleacher Report. Jeff Samardzija (6.32 ERA, 4.51 FIP, 1.340 WHIP) hasn’t gotten off to a very good start. He’s given the Giants length, pitching into at least the sixth inning in each of his first five starts, but San Francisco has lost four of those games. Samardzija’s strikeout (25.9 K%) and walk (7.4 BB%) rates have been good, but he’s had trouble with the home run ball — his 1.72 HR/9 thus far is his worst such mark since 2010. Adrian Gonzalez is dealing w/ herniated disk. He aggravated it two weeks ago. He says it's less severe than 2016, when he got an epidural. That is … decidedly not good. Nevertheless, González is in there, batting sixth, behind Cody Bellinger (this would be Bellinger’s sixth different batting order position in nine games). Pederson told Roberts he will return Friday. Forsythe might be a little behind that timetable. Forsythe also had some hamstring tightness to complicate his return. It’s hard to imagine that Pederson returning can mean anything other than Bellinger being sent back to Triple-A — unless, of course, González is actually placed on the disabled list. Dustin wrote about this earlier today. Scott Kazmir is throwing off the mound at Dodger Stadium. Dave Roberts, Rick Honeycutt and Farhan Zaidi standing watch. Will we be seeing him any time soon, though? Roberts non-commital about Kazmir's status.